When Marvel first announced that Captain America was a Hydra sleeper agent, I, like many of my fellow comic book fans, was a bit shaken. It seemed like another tactic to quickly boost sales for yet another big crossover event that would “change the face of Marvel as we know it.” How many times did we hear that in 2016? Too many. But as writer Nick Spencer started laying the foundation for Secret Empire in Captain America: Steve Rogers, I began to get more comfortable with this bold new idea. Spencer wrote Cap’s new status in a believable way and watching Cap’s plans come together was fascinating. The buildup to the event was a slow burn and was akin to watching Rogers play chess on a global scale, as pieces were slowly sliding into place right under the noses of our favorite Marvel heroes. After a few months, I found myself enthralled in the tale that Spencer was telling, gobbling up every issue the minute they hit the comic shop. After a solid year of buildup, Cap’s plan is finally coming to fruition in Secret Empire #0. While most event books start with a bang, this one sees Cap remain calm and collected throughout the entire book. In Secret Empire #0, we see Cap take swathes of Marvel heroes off the playing field group by group as each of his three plans come together. As the book itself tells us, Cap has always been a master strategist; now no longer shackled by morals, this is Cap simultaneously at his best and his worst. I can’t wait to see how far he will go when he needs to get his hands dirty and handle the heroes personally. The art by Daniel Acuna is as excellent as Spencer’s writing. Each character’s face conveys a broad range of emotion, which is fantastic since there is a lot of emotion on display in this issue. You can feel the fear and despair dripping off the faces of every Marvel hero as they realize the grim reality that awaits them. 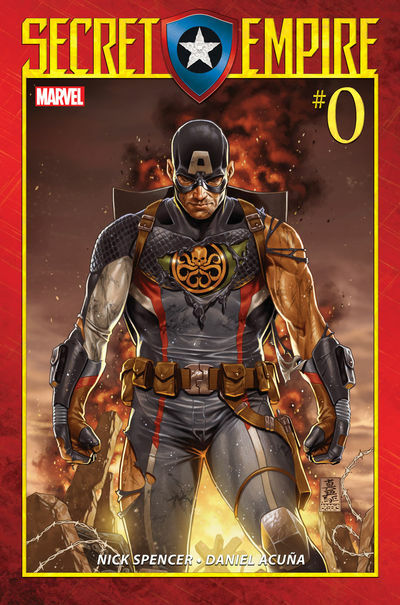 Issue #0 is a must-read comic if you’re planning on reading Secret Empire. Even if you haven’t read any of the issues that precede this event, this still serves as an excellent starting point and quickly gets new readers up to speed. If every issue in this event can match the writing and art of this one, Secret Empire as a whole will end up as one of Marvel’s best events. After nearly everyone called this storyline the worst thing to ever happen to Captain America, it just might end up being the best thing to happen to the Marvel Universe in years. PRE-ORDER SECRET EMPIRE AND SAVE!